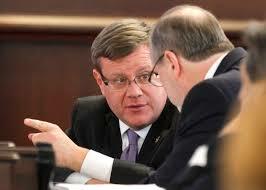 Wake County District Attorney Lorrin Freeman has asked the State Bureau of Investigation to look into concerns about NC House Speaker Tim Moore’s apparently magic talent at making money appear in his office. They know Moore's talent in Cleveland County, which he represents in the General Assembly. “Tim left for Raleigh driving a beat up Honda and he’s come back driving a Maserati” (anonymous Cleveland countian). After he became Speaker, which required him in Raleigh practically all the time, Moore got a $25,000 sinecure as county attorney for Cleveland Co., and he's been in the press for unsurprisingly vague and incomplete campaign finance reports. He's also accused of leaning on the Department of Environmental Quality to let him off some environmental violations on property he owned in Siler City. Among other questionable stuff. Two years after then-House Rules Chairman Tim Moore’s legislation rescued a controversial south Durham mixed-use land project [751 South] and boosted a high-end residential community [Colford Farms] next door, one of the developers took him on as his lawyer. And two years after that, the same developer, Neal Hunter, gave Moore a legal services contract for a Durham-based pharmaceutical company Hunter had recently co-founded, paying him $40,000 for four months of work largely related to how federal tax law treated such startups. The implicit charge against Moore: Getting cash or cash-equivalent payback for legislative favors. Sinecures -- jobs with no duties but good compensation, like, say, County Attorney of Cleveland County -- are kind of a Tim Moore specialty. His influence is invaluable, his friendship, fungible, and his ability to pass laws and skirt regs, unsurpassed. Naturally, Speaker Moore denies any connection between what his right hand was doing while his left hand was relaxing. And the elaborate explanations, rationalizations, and blessed sanitations that he offered to reporter Dan Kane in the News and Observer today just don't ring true. Where there's smoke there's mirrors? Apparently, his Democratic opponent in the 111th House District is too nice a guy to use Moore's corruption against him. He doesn't want to be a "typical politician." He doesn't want to be accused of "gutter politics." He apparently also doesn't want to win either, a mistake often endemic among nice-guy candidates. Too bad, because in a year like 2018 in North Carolina, even the Speaker of the House could be beaten, and you don't know the numbers of people in the 111th District who don't have a clue about Tim Moore.